The WHO European Office for the Prevention and Control of Noncommunicable Diseases (NCD Office) works closely with WHO/Europe to bring together leading international experts in the area of NCDs. It organizes international conferences and meetings that give participants opportunities to share knowledge, experience, challenges and successes, and collaborates with world experts to develop training courses. The NCD Office also convenes international expert groups to analyse and synthesize the best available evidence from around the world. This provides new perspectives and approaches, supports the development of guidelines and recommendations, and gives rise to innovative studies that will close existing gaps in the research on NCD prevention and control. Another function of the NCD Office is to conduct national capacity-building activities in countries in the Region in which millions of citizens speak Russian. Making international knowledge and best practices accessible to them is crucial. Translating all WHO websites on NCDs as well as key WHO documents on preventing and controlling NCDs into Russian has greatly increased accessibility and dissemination. 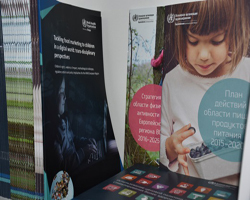 Datasets, publications and tools developed with support from the NCD Office or funded by voluntary contributions of the Government of the Russian Federation can be found via the links below.